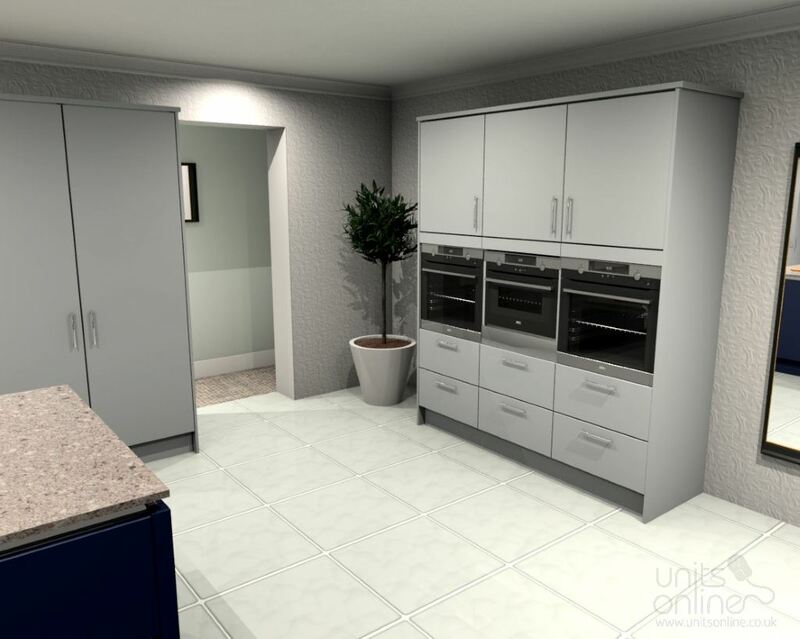 Buying from Units Online allows you to save thousands of pounds ordering a new kitchen. 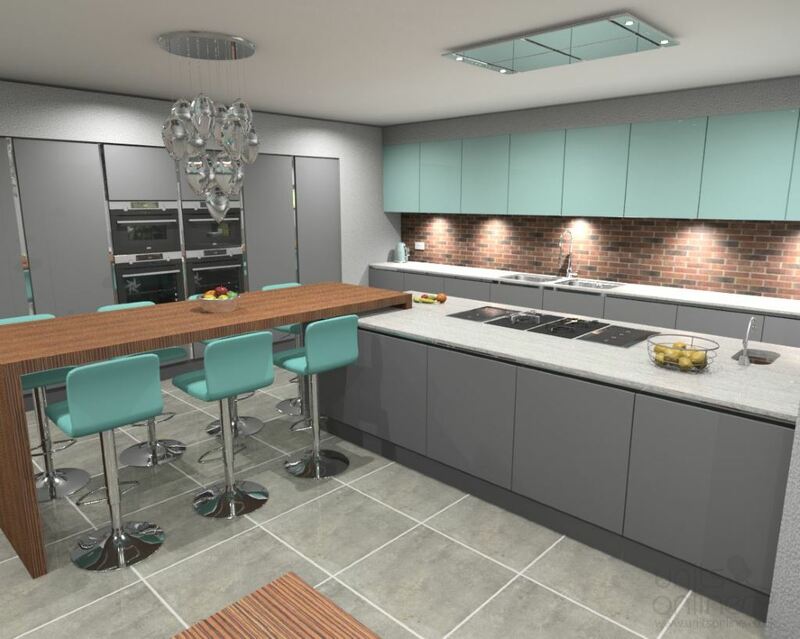 We know the processes involved in designing and ordering of a kitchen is not an easy task. 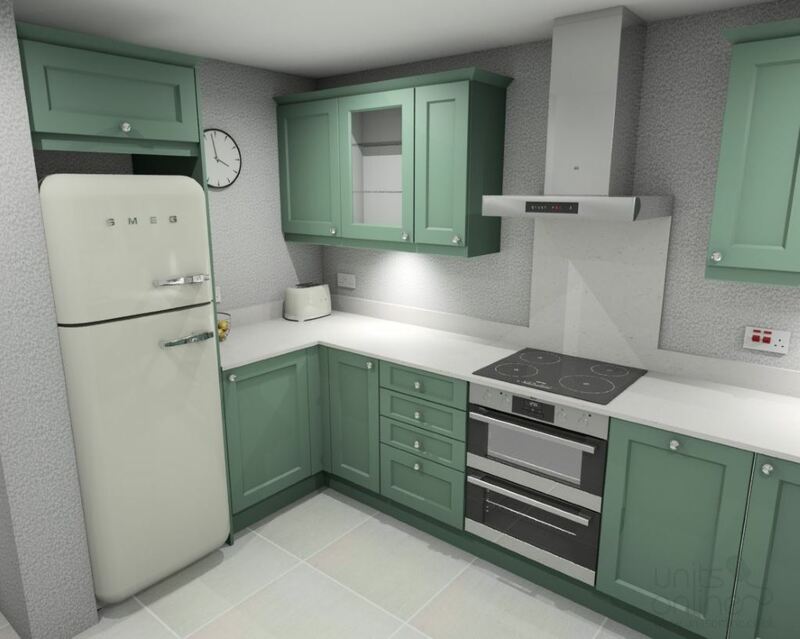 There are many kitchen planning guides, tools and layout templates available, which are a good first step. 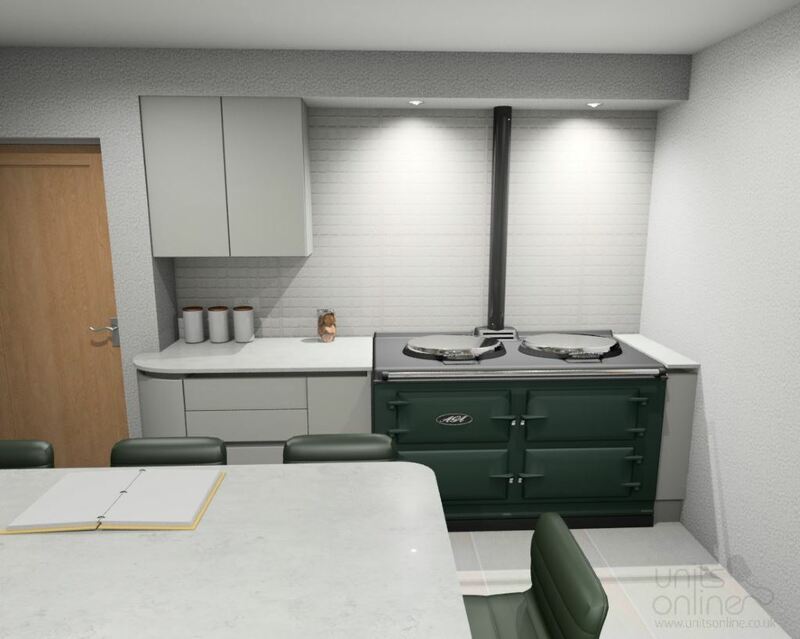 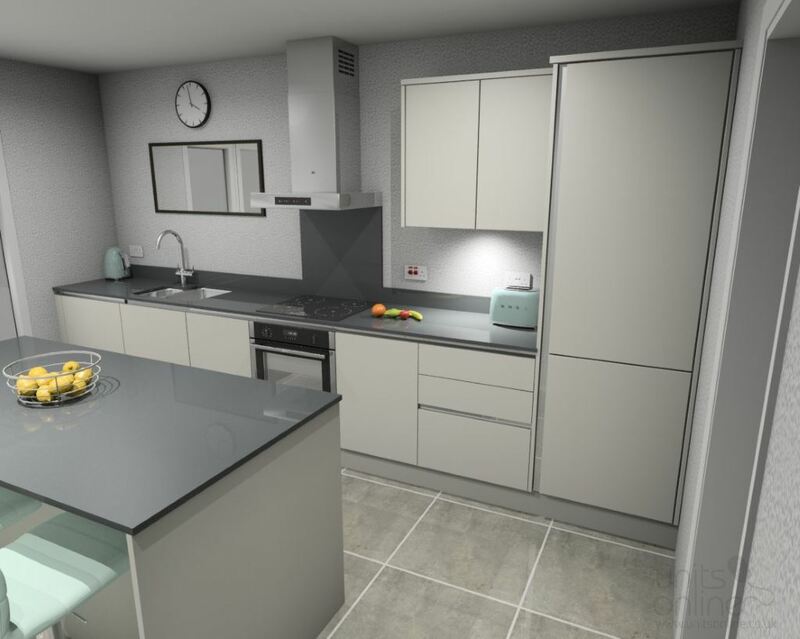 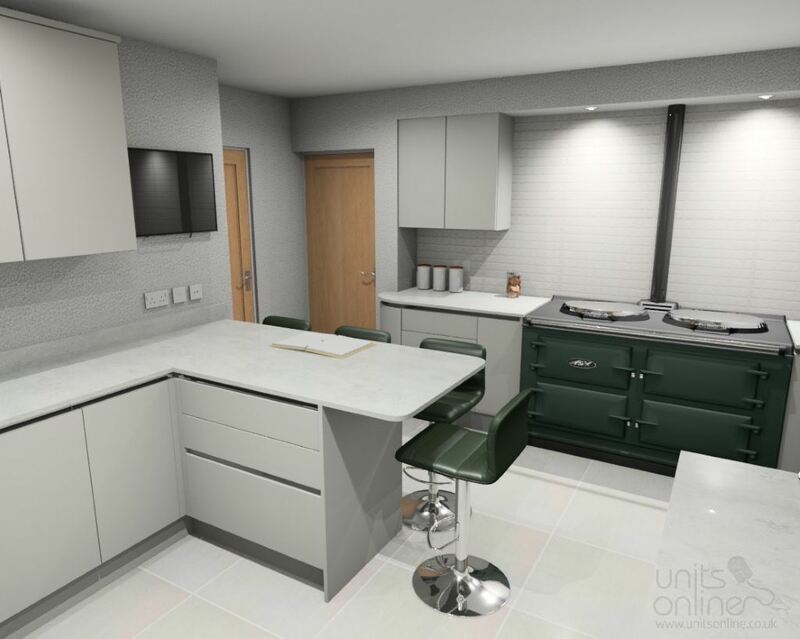 However, if you need this to be developed from a simple kitchen plan, our planning service working with one of our designers can transform this into an accurate kitchen design. 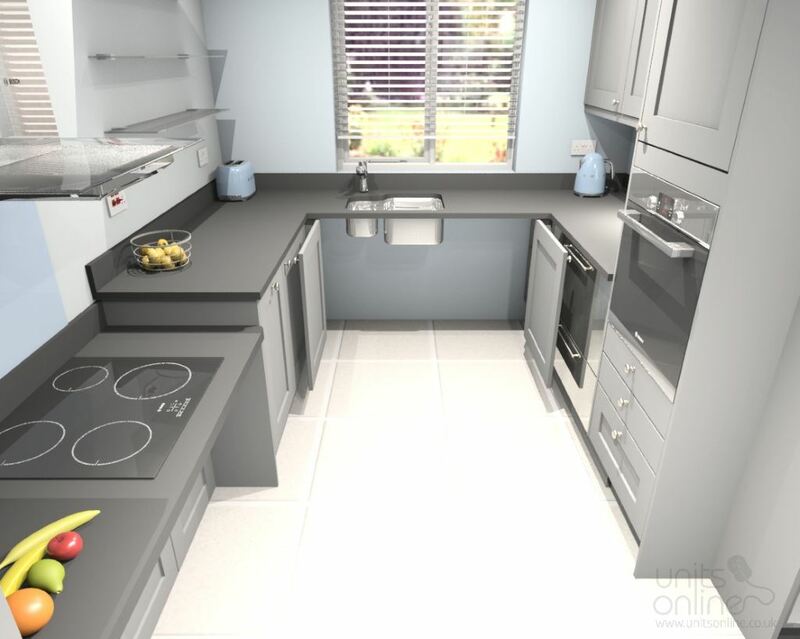 Whether it is small kitchen design ideas or a larger kitchen project which incorporates islands and utility rooms the first step is ensuring your kitchen has been planned and specified by a professional kitchen planner / designer. 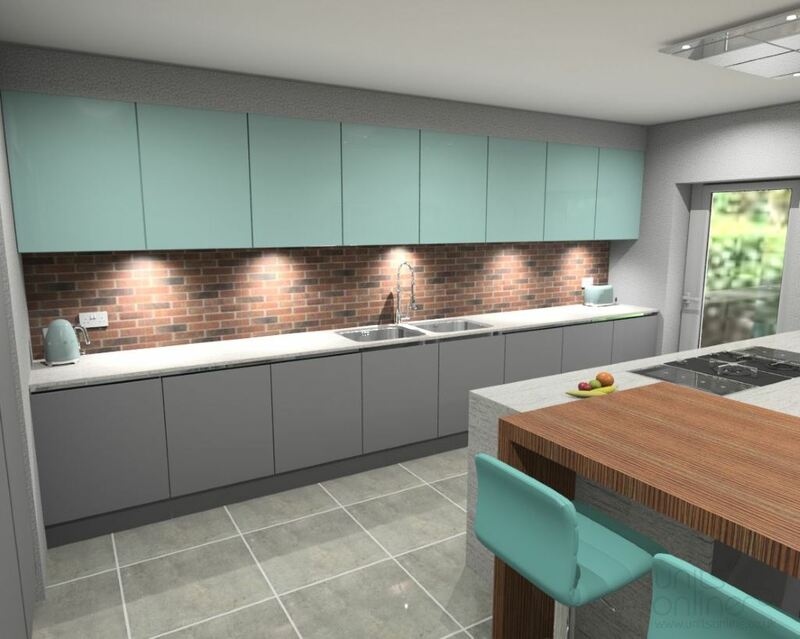 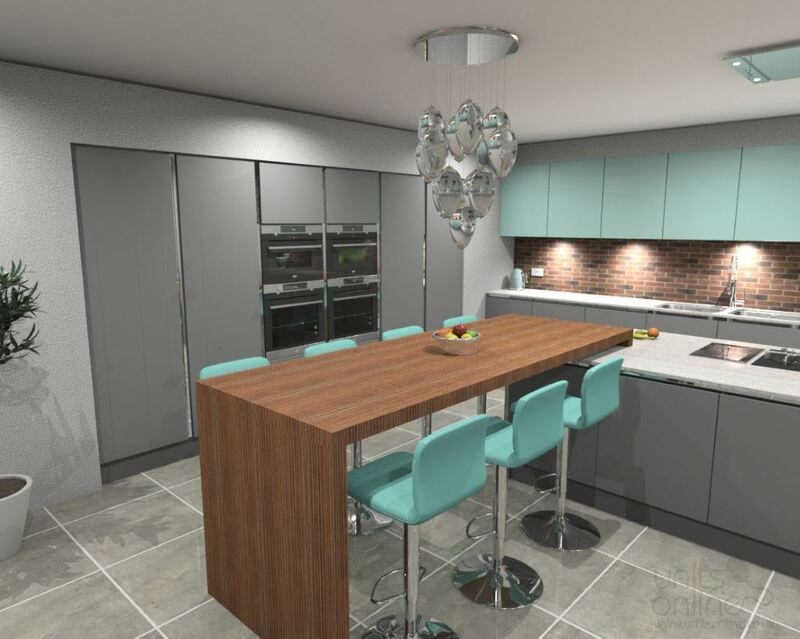 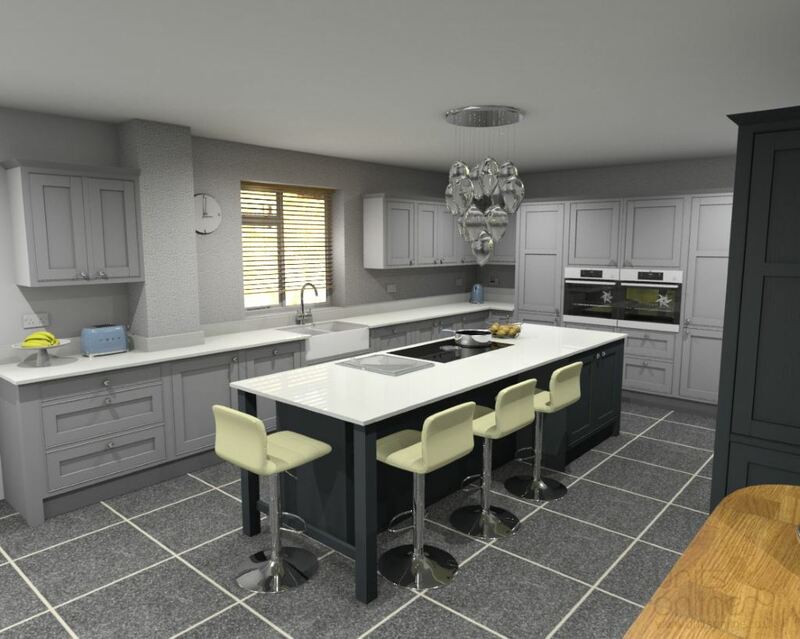 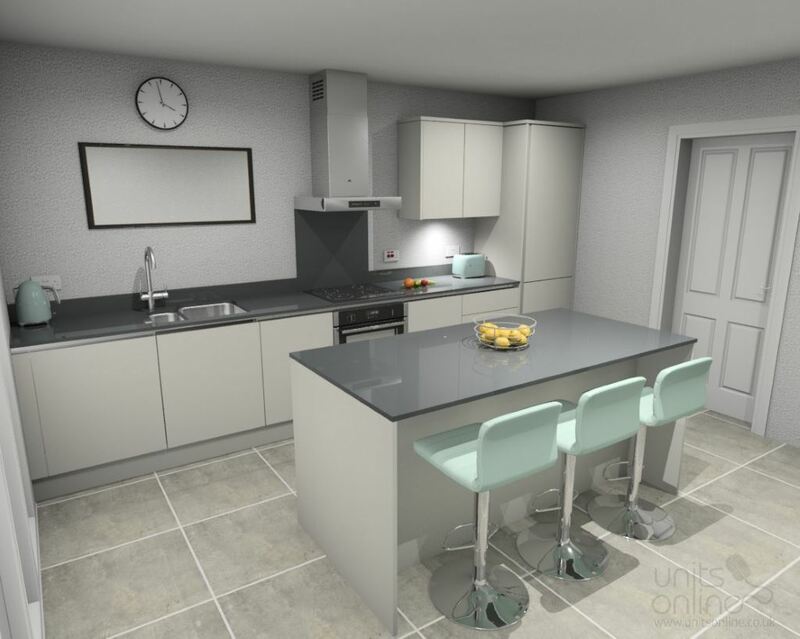 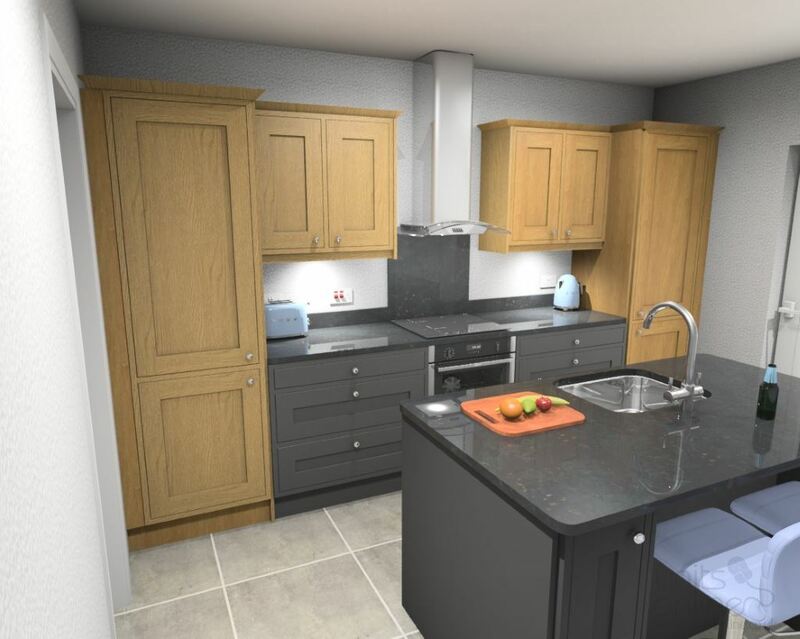 By using our kitchen planning service we give you the opportunity to have your kitchen planned by our expert designers, with more than 20 years’ experience each in planning and specifying quality kitchens. 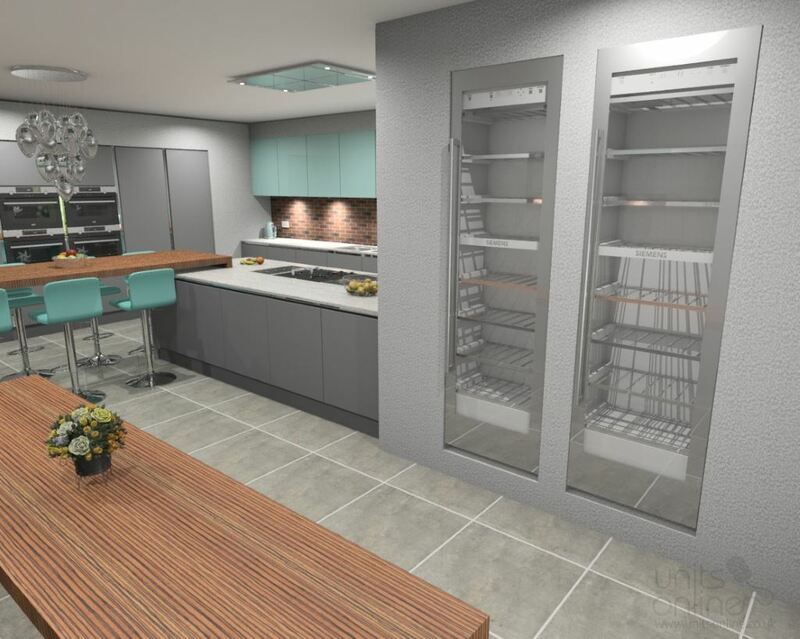 As we manufacture the units in our factory to suit your kitchen we can offer the widest range of units available online in the UK meaning we can tailor make units to solve difficult planning problems that other suppliers might not be able to offer. 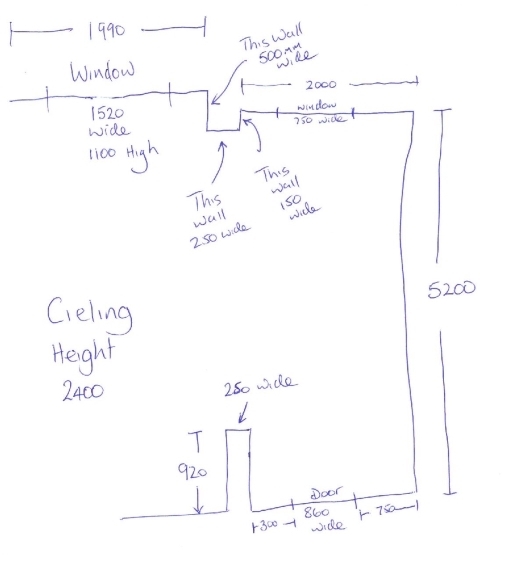 Just ordering units is not always as simple as it seems. 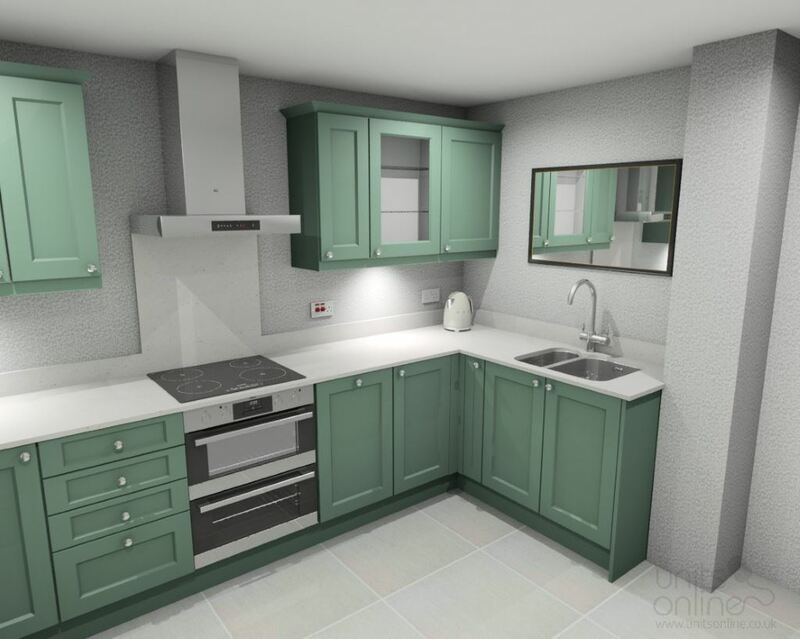 It is vitally important that the fine details, fit and finish have been thought through carefully to ensure the final result is exactly as you envisaged. 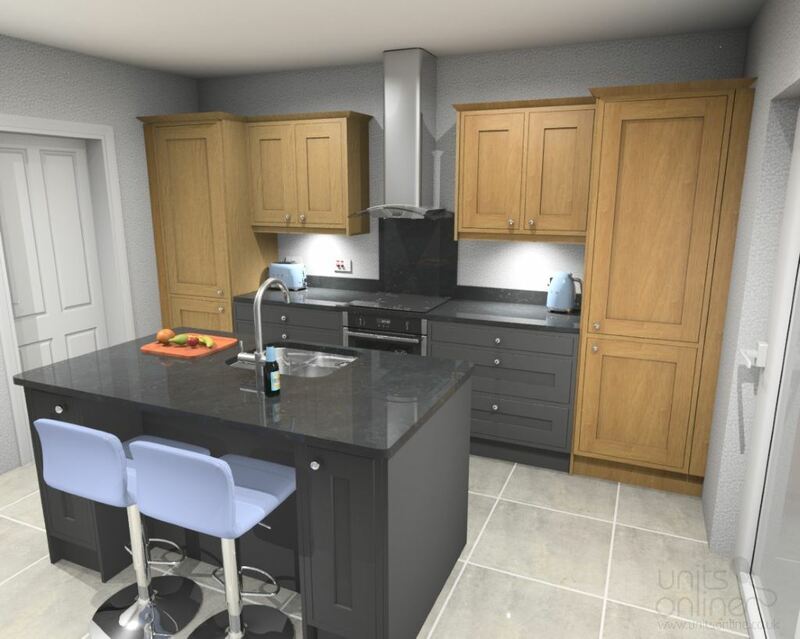 Our professional planning service will provide you with dimensioned plans and elevations to ensure your kitchen fits perfectly and is finished to the highest standard. 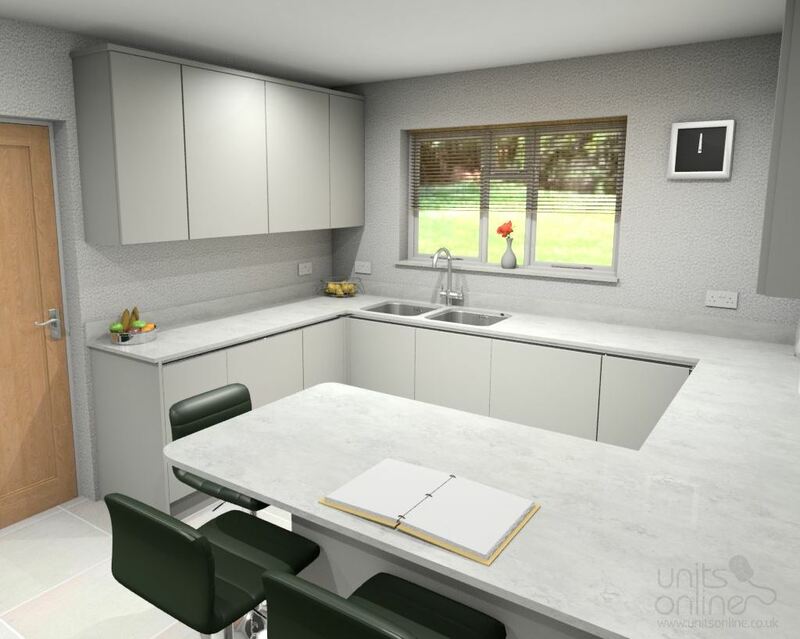 We know it is difficult to get right first time so we will work with you and provide a maximum of one major and 2 minor amendments to get the plan perfect. 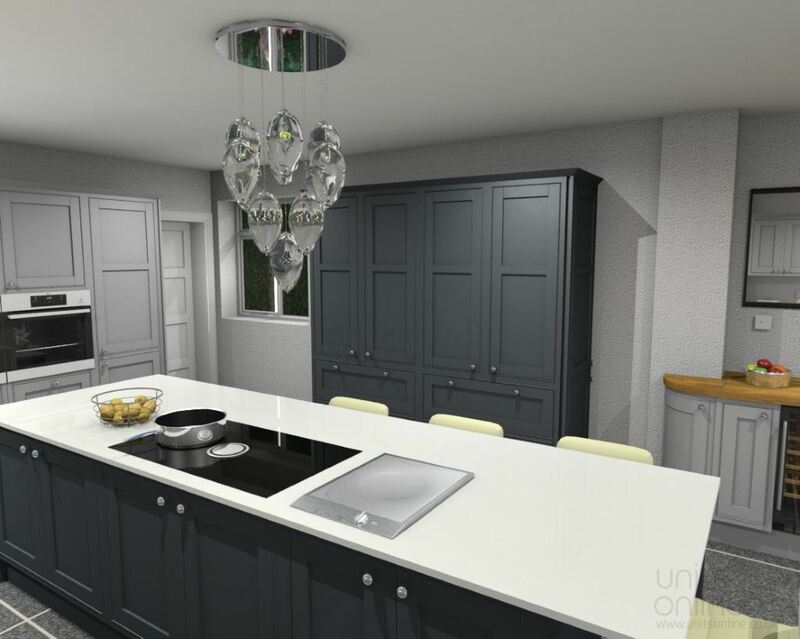 Essentially we are offering a level of service normally only available from high end showrooms without the cost or time restraints. 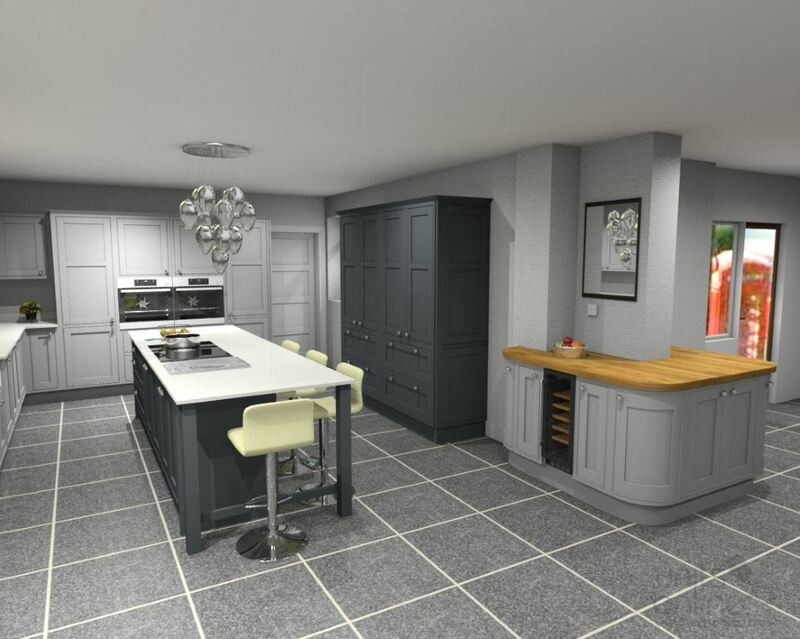 Take a look and see how the process works from inception to final kitchen and please check out our testimonial page to see how our clients have used the planning service to great effect. 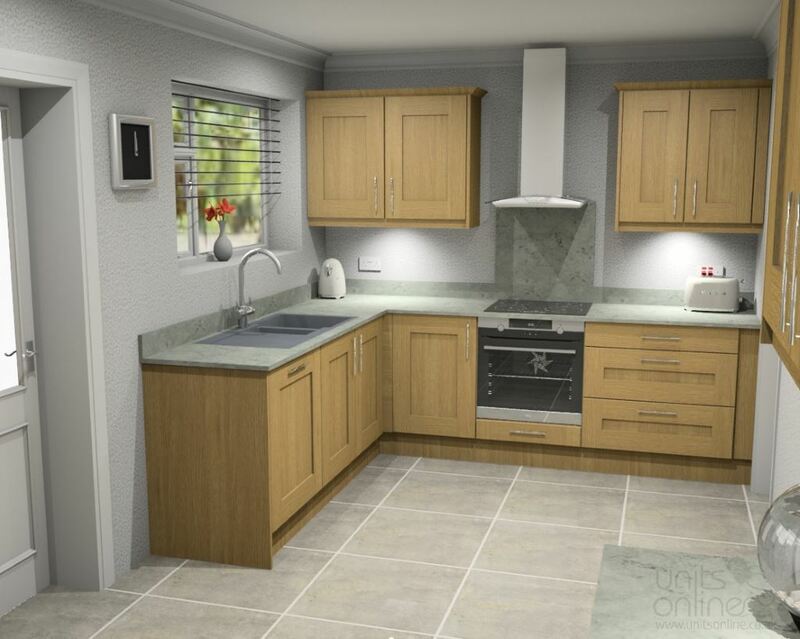 Send in the room dimensions plus your kitchen layout ideas along with a list of appliances you are thinking of using. 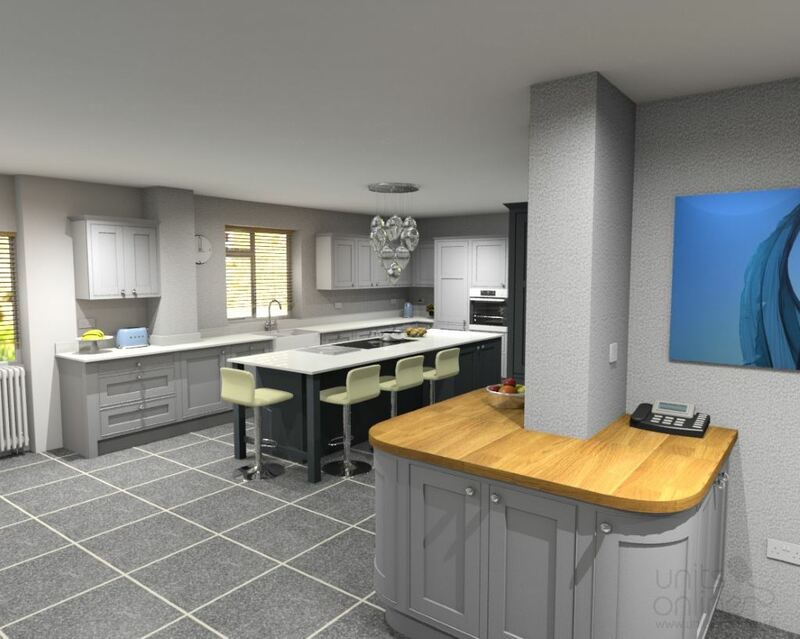 Alternatively we regularly work with customers using their existing plans, often being able to suggest other solutions and layouts based around the original plans. 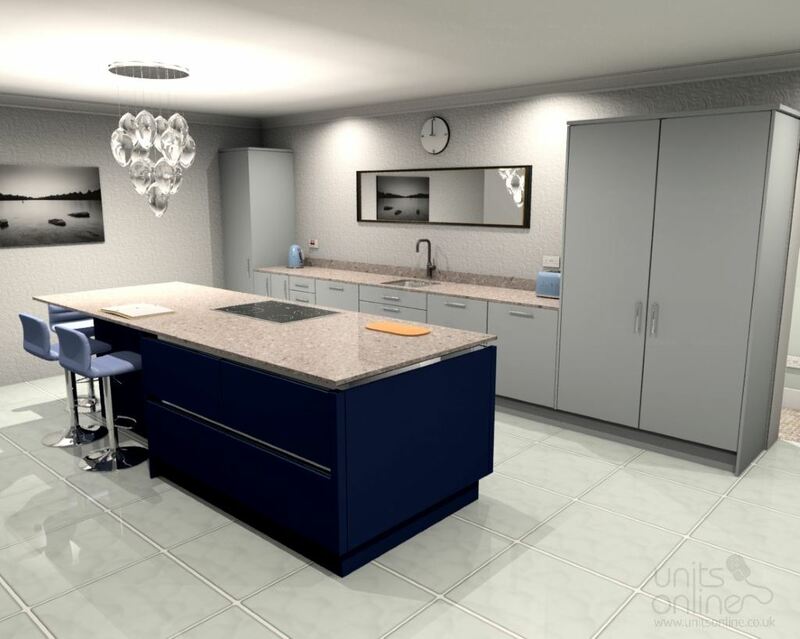 You can send your plans and ideas by email, in which ever format is easiest for you, and one of our designers will start working with you. 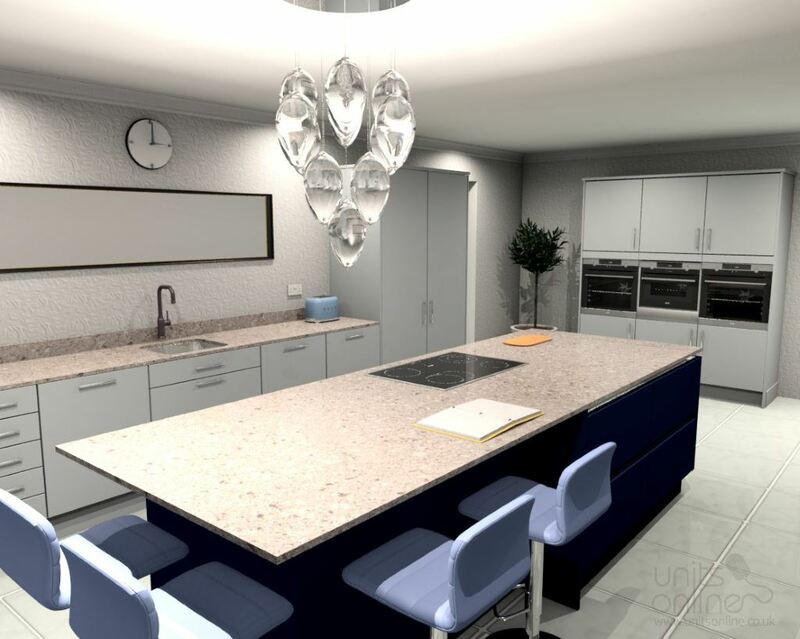 The client asked us to create a kitchen based around their family life and the regular social events they hold at home. 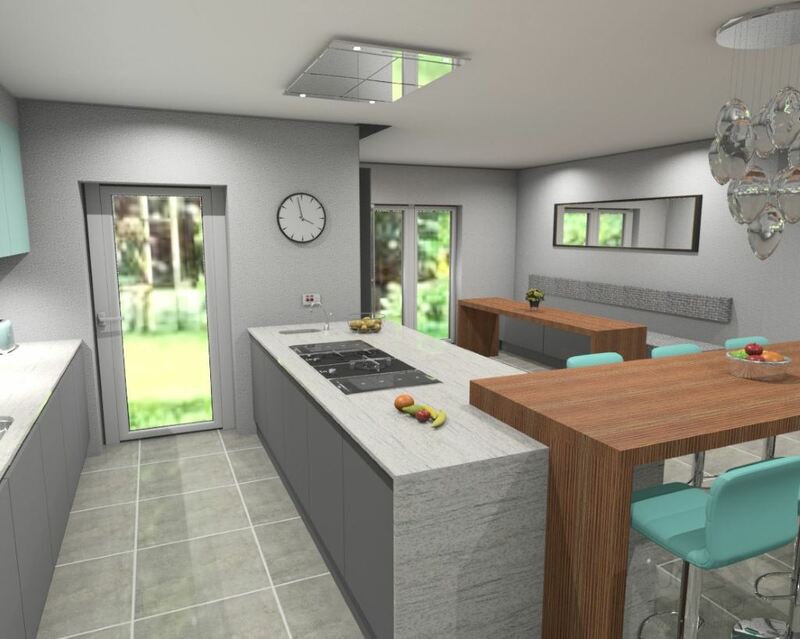 They asked for a modern look with a streamline look around the outside of the kitchen with lots of storage as well as plenty of interesting seating making use of the views to the garden. 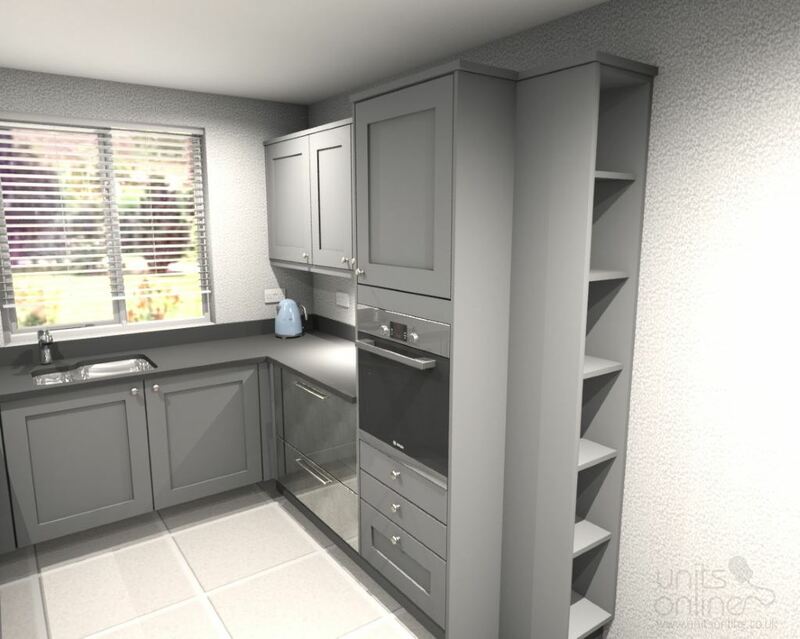 To meet this brief we designed the tall units and base units around the outside of the kitchen to look like they are set into the walls using simply but clever design methods to achieve this. 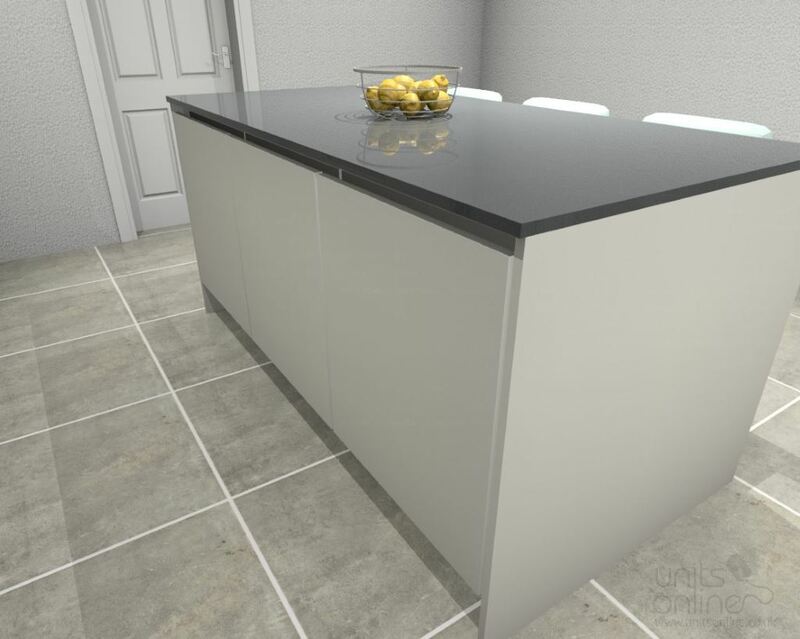 We also used the same technique to make the wine coolers appear as if they too are set into the walls achieving the modern sleek look the client requested. 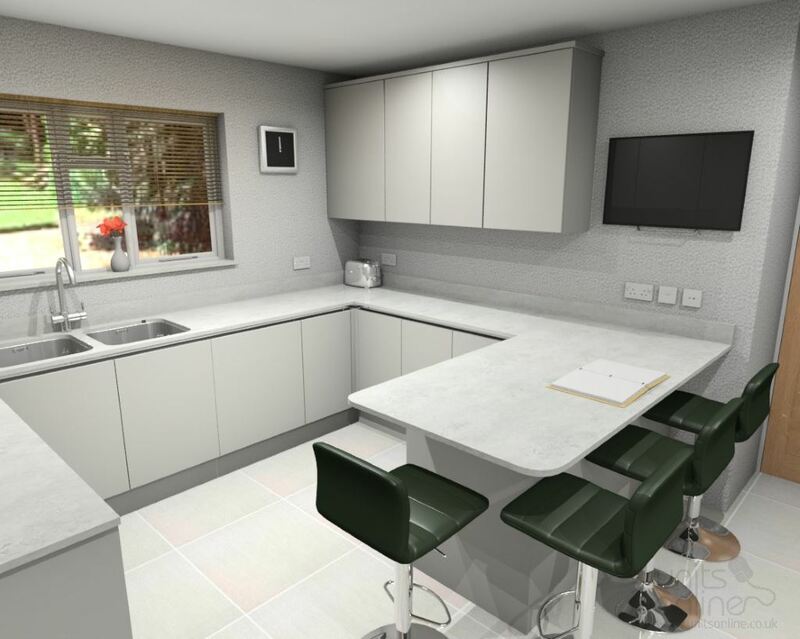 With the rest of the kitchen we have designed split level seating at both higher stool height as well as low level seating with storage below offering excellent views of the garden. 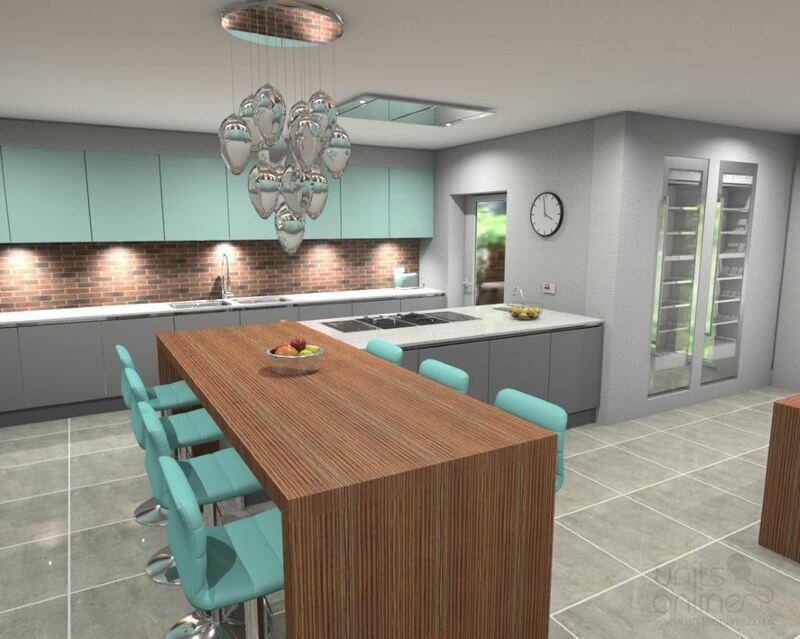 The kitchen is a true handleless kitchen in Silver Grey and Teal with silestone worktops and Zebrano timber worktops for the tables.